This is a well built (circa 1900) croft cottage which has been renovated and overlooks Loch Beacravik and Loch Geocrab and is situated between the road and the sea in the wild of rocky landscape of South East Harris, Outer Hebrides. Visitors love looking out at the wildlife in the loch, where otters, seals and birds are often observed. 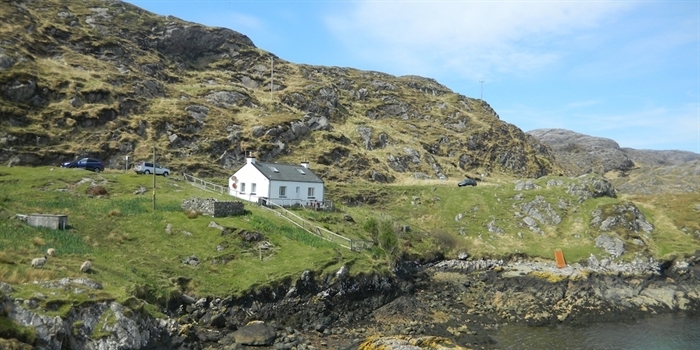 This is a well built (circa 1900) croft cottage which has been renovated and overlooks Loch Beacravik and Loch Geocrab and is situated between the road and the sea in the wild of rocky landscape of South East Harris. Access from the road is very short with a small parking space on the road. Own fishing (see below) - per day or week at an extra charge. Sitting/dining room with kitchen area. Bathroom with bath, shower, whb, wc. Freesat TV, CD player, DVD and VCR player. Electric cooker, microwave, fridge/deep freeze, dishwasher, combination washing machine/tumble dryer. Linen is supplied (beds have duvets). Electricity: included from 1st Apr - 30th September; by meter reading from 1st Oct to 31st March.